Osoba na zdjęciu bardzo przypomina nam naszego dziadka Wołodymyra Poliwka. Wiem, że ojcem Wołodymyra Poliwka był Teodor Poliwka, i że Wołodymyr miał jedną siostrę. Wołodymyr Poliwka zginął w Samborze w sowieckim więzieniu, zamordowany przez NKWD, kiedy Rosjanie się wycofywali pod naporem Niemców w 1941 r. – tzw. masakry więzienne. Jeśli to nasz dziadek, to jego syn nazywał się Igor Orest Poliwko a nie Jarosław. Hi Anna,I recently recieved an email from Irek owner of the site that Wladik Polwika was my grandmother Katherine Polwika Shlatz(Shlyahtych	Shlyakhtich	Szlachtycz )brother do you know this for certain?Is the house still standing in Poland?My grandfather Ivan or John Shlatz came to the USA around 1912.Any Info you may have would be great any relatives still there?Thank you,Alex Shlatz ( Katherines grandson living in Homosassa,Fl but grew up in Enfield,Ct where my grandparents had a farm growing potatoes. http://www.ulucz.org/?p=201 (in this picture you can see Wolodymyr Poliwka – the third person from the right second row from below). I have the impression that the phisis of Wladik Poliwka is quite the same, and the name Wladik may be the Polish version of Wolodymyr. Is your grangma the daughter of Teodor Poliwka? The problem is that I don’t remember if Wolodymyr Poliwka had 2 sisters. I know about his one sister who was married to Polish teacher and they lived in Poland during the 2WW and during „Akcja Wisła” in 1947. Their daughter lived (probably) in Kołobrzeg – she visited us in Gdańsk one time. Is it possible that your grandmother Katherina had a sister as well? If not, Wladik Poliwka can be the descendant of one of Teodor’s brothers (if he had one). The whole village Uluch was destroyed by Polish army and paramilitary forces of Polish neighbourhood. However there is a great Greek Katholic Church left on the top of the hill called „Dubnyk”. We only met this daughter of Wolodymyr’s sister. Hi Alex. When I was studying my family archives I found the pictures which had been sent to us in 1974 from America (from the USA I suppose ). I can see in these pictures the Shlatz family: Myron + Barbara and their children: Kathy and Rick. I think Myron Szlachtycz can be my father’s (Igor Poliwko) cousin from his father’s side. That is why I think Katherina may be sister of Wołodymyr Poliwka my father’s father. Is Myron Shlatz (Szlachtych) known to you? Our grandgrandfather was Hilary Poliwka (nickname Diak). He was the father of Kateryna Szlachtycz (nee Poliwka) and my grandfather Wołodymyr Poliwka (1909-1941). Hilary Poliwka died just before the 2 WW. His daughter-in-law (my grandma) was present at his death and often recalled this event. 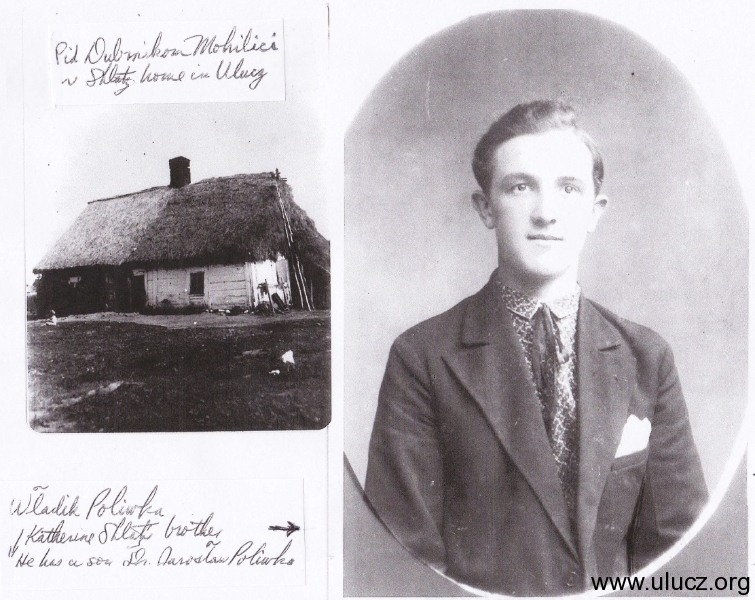 Wołodymyr Poliwka (your grandma’s brother – called, in this photo you have posted, Władek) was killed by the Soviets in 1941 in prison. Hilary’s wife died in 1946/47 in Dobra (the second village) where they escaped after Ulucz had been burnt by Polish troops. She went with my grandma – the widow of her son, and my father Igor Poliwko. There was another daughter of Hilary Poliwka, she was married to Polish teacher. I remember her daughter (probably from Kołobrzeg) visiting us in Gdańsk one time. So, I know there were 3 children of Hilary Poliwka. The house of Poliwka family was in the centre of Ulucz – so called Kut – opposite the manor house (across the road). They had fields by the San river – so called Bołonia. Ja z kolei jestem powiązany z Wasylem którego powieszono jestem prawnukiem Tomasza Poliwki ( nazwisko już spolszczyli) który miał siedmioro dzieci w tym mojego dziadka Jana, wszyscy osiedlili się w okolicach Jasła / Dukli. Dzieci drugie syna Wasyla syna Jana zostały re lokowane po wojnie w okolice Szczecina i Wrocławia wraz z całą rodziną z terenów które trafiły do obecnej Słowacji bo nie chcieli wracać na wschód. Wiem też o części rodziny w Chicago bo mój ojciec pojechał w 96 roku na kilka lat do swoich „kuzynów” trochę dorobić .